Entries for The Chiltern Hundred cycle sportive open at 10pm this evening (20th Jan). Taking place on the 27th May, organised by the Verulam CC (St Albans) and Amersham RCC and run on non-profit making basis, the event offers a choice of 3 route options ranging from the 100 mile plus full distance Gran Fondo route to the shorter Corto Fondo route coming in at just over 50 miles. Organised by the Verulam CC (St Albans) and Amersham RCC the event is non-profit making and is organised by sportifs for sportifs. “The Gran Fondo is an uncompromising road romp across 177 km of the toughest and most picturesque terrain in the Chilterns. It is relentless in its pursuit of hills, 21 in all, routinely climbing at over 15% grades. From Great Missenden to Dunstable Downs, then SW for the shake down along the scarp slope where the biggest and steepest hills await you. From Watlington return to Great Missenden over the final 6 leg numbing climbs. The Medio Fondo offers a tough 75 mile ride. 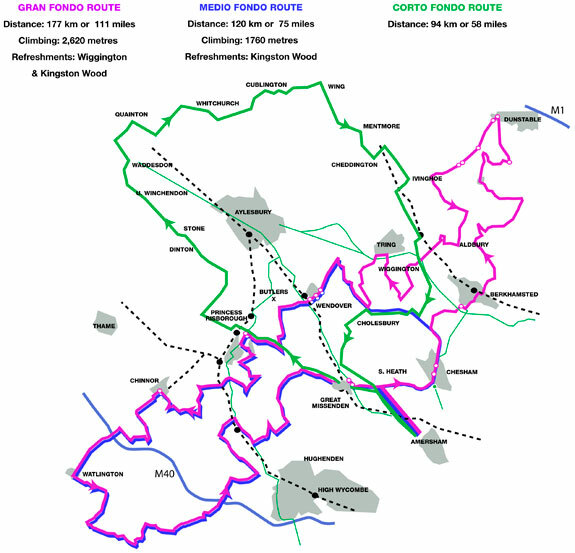 The route splits from the Gran Fondo shortly after Chesham and passes through Cholesbury before rejoining the Gran Fondo for the descent of Aston Hill near Wendover. It follows the same route as the Gran Fondo to the finish and is absolutely jam packed with hills.